Hibiscus trees are a variety of flowering plant that is comprised of more than 200 different species. Hibiscus trees generally appear in warm climates, such as subtropical and tropical areas. Both annual and perennial hibiscus varieties exist. The trees are commonly used as ornamental plants, but also have a lot of other practical uses, as well. In general, hibiscus trees will grow to about 10 feet in height. They have colorful and large blossoms that are shaped similarly to trumpets.The flowers of the trees come in various different colors, which include pink, peach, salmon, yellow, purple and dark red. The leaves are a deep green color. 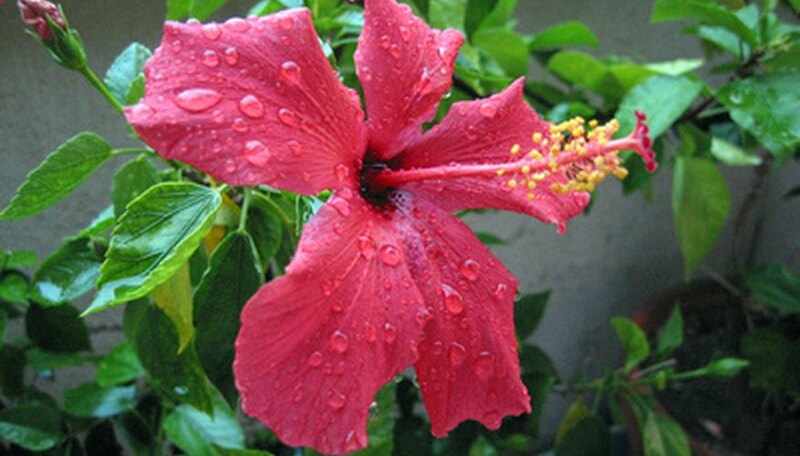 Hibiscus trees are not susceptible to many diseases, except in cases perhaps where under or over-watering occurs. Pests are by far more of a problem with hibiscus trees. Some potential insects that could lead to damage to these plants include mealy bugs, white flies, aphids, Japanese beetles and spider mites. These pests can be eliminated with the use of a mild-strength insecticide. Lower temperatures can also help prevent them from appearing in the first place. Certain species of hibiscus flowers produce hairy seed pods that could lead to skin irritation. As a result, in order to avoid irritation, it is beneficial to wear gloves while handling the flowers of the tree. Hibiscus trees grow well in sunny and warm areas. When growing these trees, it is vital to ensure that they receive abundant sunlight. A lot of water is also necessary. Plants and weeds need to be eliminated before a hibiscus tree is planted, as they could compete with the plant for both nutrients and water. The full roots of the weed need to be removed. Moist soil is necessary. The plants need to be fertilized approximately every other month. The fertilizer should consist of nitrogen, phosphorus and potassium. Since hibiscus trees do not do well in cold climates, it is often necessary to move them indoors during the winter months. This is in cases of temperatures below freezing (generally below 40 degrees). The tree needs to be dug up, with special care to avoid cutting the roots. It then needs to be placed into a pot that is about 12 inches across in width. This enables the roots to spread and grow.